In our Seattle East-side eastward home, I had open shelves in front of the window above the kitchen sink, full of a blue glass collection: bottles and goblets mostly, in turquoise and cobalt blues. It was blue beautiful when the rarely-there sun shone in that window from our back secluded acreage yard. Almost like stained glass. Blues and then later, a few greens and purples added too. The otherwise quite white kitchen would be filled with shades of blue-ish light especially on those special sunny summer days. Throughout the kitchen, there was only one lone wall that begged for a painting – it was beside the table eating area that overlooked the long adjacent family room, that was full of paintings. I didn’t think long on what to paint on a fair-sized canvas for that purple to greenish blues vision. 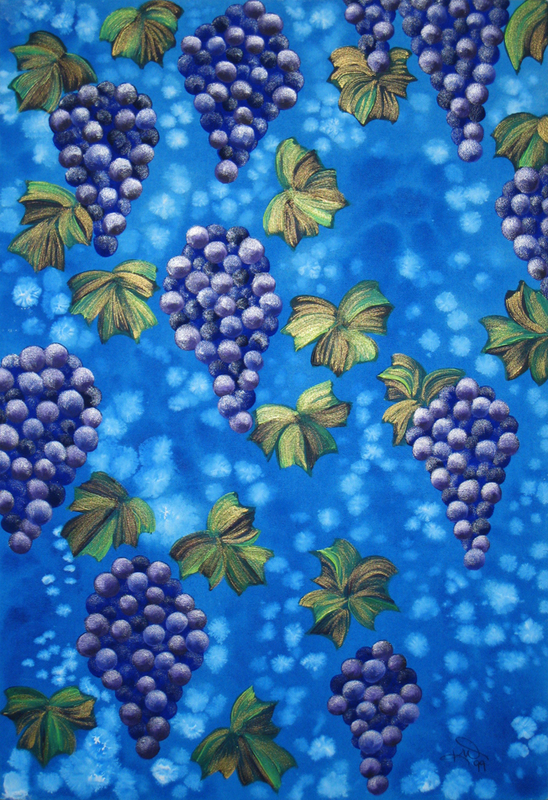 I decided to do a splash of grapes. Ultimately, it ended up with raining clusters of grapes. Yummy. For my kitchen of blues. And purple. And Green. Tasty. Grapes.